The Nimmons House is a beautiful and extremely rare surviving ranch house built in 1898 in the Queen Anne Revival style. It is the one of the most significant examples of a ranch house of that period in Calgary’s history- the golden age of ranching at the end of 19th century, where outlying ranches and quarries met the new urban form of development in Calgary, the boundary of two eras and two cultures. The situation of the house on the bluff at the eastern edge of the 3-D Bar Ranch afforded a spectacular view over herds of cattle grazing where 17 avenue is today and on to the new town emerging along the banks of the river valleys below. William Nimmons’ quarry and brickworks located on the ranch would help build not only his own house but the Lougheed Mansion, the Carnegie Library and many of our sandstone schools. Though the site has been on the register of Provincial Historic resources since December 1978 and is on the City of Calgary Inventory of Historic Resources, it has no legal protection until it is designated as a municipal or provincial historic resource. An application for development of the large site included a provision of historic designation for the Nimmons Residence with a condition that included moving the house to another location within the site boundaries. The Historic Designation bylaw for the Nimmons Residence went to Council recently but was abandoned because the original development plans for the site were no longer relevant, and a new potential owner was looking at a new and much larger project. We understand the original agreement to designate the resource is still in place in the interim. This presents an opportunity to revisit retention of the Residence in its original historic placement on the site. The previous Nimmons designation proposal gave the City the ability to move a property prior to designation as a way to save a property that would otherwise be demolished to make way for development. The concept was admirable in its attempt to save the structure but circumvents best practises of heritage preservation and the clear intent of the The Standards & Guidelines for the Conservation of Historic Places in Canada by not following the principals and priorities that will be in effect immediately upon designation- in essence removing inherent character defining elements. In this case those criteria include situation of the house on the site and the extremely significant setbacks of the house. CHI recognizes that a designation bylaw is put in place to preserve a resource and manage the reality of changing circumstances of Calgary’s heritage fabric in the growth of the City. However the Guidelines state as its first of fourteen priorities under General Standards (for preservation, rehabilitation and restoration): 1. Conserve the heritage value of a historic place. Do not remove, replace or substantially alter its intact or repairable character-defining elements. Do not move a part of a historic place if its current location is a character-defining element. 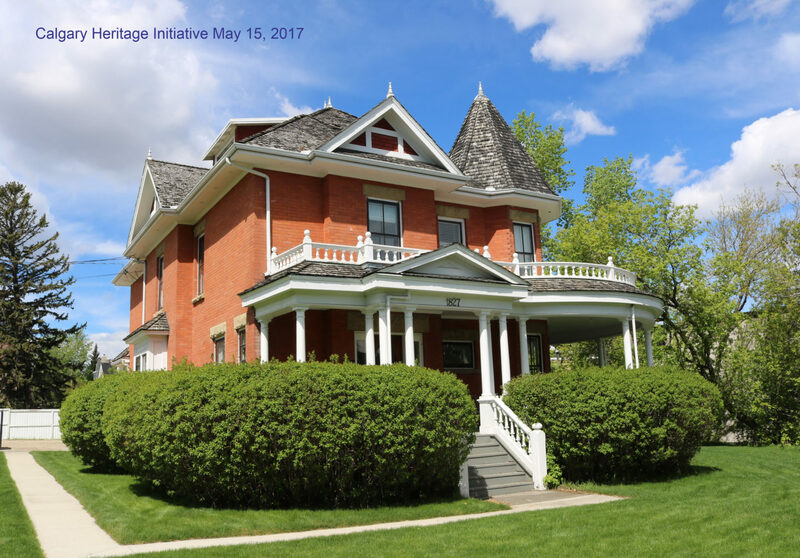 The Calgary Heritage Initiative Society believes that the moving of a heritage structure within a site should not be considered where the present location and placement of the resource on the site is a character-defining element. Planning discussions with the new owner should reinforce that high quality development and viable economic use of the land can be achieved while retaining historic integrity of the resource. Moving a resource is always the last possible option and only when extraordinary circumstances dictate. Suggesting that the principals and guidelines for heritage preservation are somehow malleable to developer’s wishes sets a very bad precedent (similar to moving the Eau Clair smokestack but without requiring that pesky de-designation first). Using this rationale any future designations could include an agreement that in order to expedite development of any sizable property the historic structure can be relocated anywhere within the site, at the convenience of the developer and with risk of damage, prior to designation. CHI urges the City of Calgary to take into consideration the intent of preservation principals of protection and enhancement (as outlined in the heritage policy of the Municipal Development Plan) when considering development on historic sites or streetscapes, and send a message to the citizens of Calgary that heritage preservation is a priority, not an inconvenience or afterthought. Why CHI Loves Secondary and Backyard Suite Reform in Calgary!